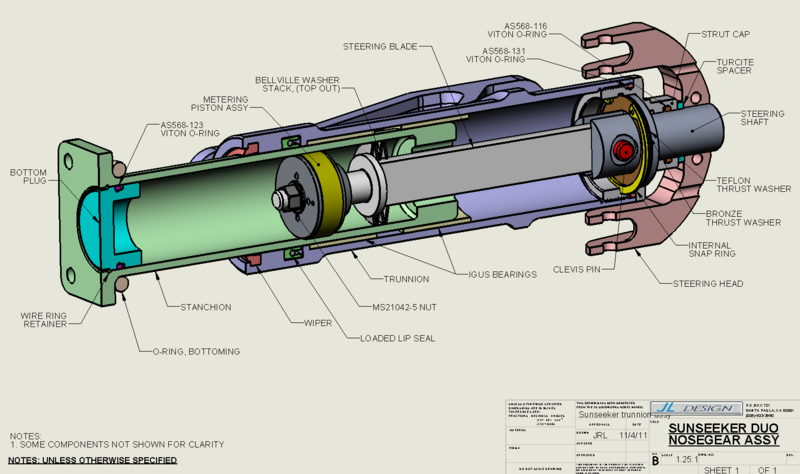 Here is a cutaway drawing of the trunnion assembly, showing the major components. I’ve removed some of the steering head linkage for clarity. The unit is an air/oil spring, with air pressure acting as the spring, and hydraulic fluid being forced through orifices to act as the damper. 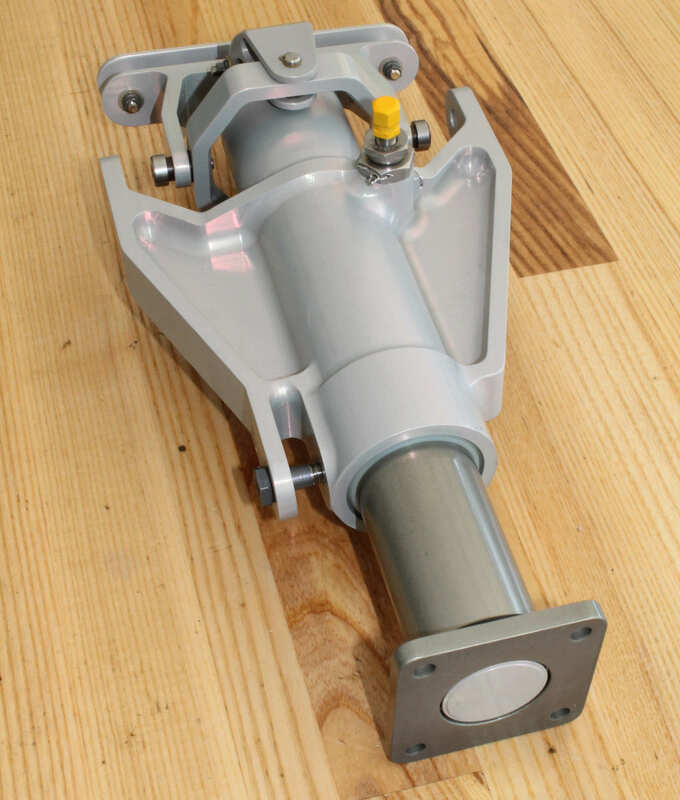 In addition, the steering bellcrank on top turns a steering “blade” that passes through the stanchion (moving cylindrical part), so that steering input is connected to the nose wheel. The amount of air pressure needed depends on the weight on the nose wheel, and for this airplane it’s no more than about 45 psi in the extended position. This is a recently finished part that we did for Eric Raymond, who is currently building a 2-place solar powered airplane in Europe at www.solar-flight.com. The mechanical design of the nosegear was done by Rick McWilliams at Tangent Instruments, with assistance on the shock absorbing portion from Gil Vallaincourt of Works Performance Shocks. Eric is building an extremely light and efficient airframe from carbon fiber, and weight is a huge factor. So this unit has to incorporate oleo-pneumatic shock absorbing and damping, steering, and retraction- all in a very compact unit. Total weight with hydraulic fluid is about 4 pounds, and the design has been optimized with finite element analysis to meet the anticipated landing loads. The trunnion (main piece) is 6061T6 aluminum, machined from the solid, Type I anodized, and the stanchion (moving cylindrical piece) is 7075T6, because it sees the highest stresses. It is hard anodized and polished for wear resistance. Most of the fasteners are titanium. It has some fairly fancy internal bearings and seals. I will publish additional bits as I go along showing how some of the components were made. We can’t wait for his first flight.